Might as well collect miscellaneous Edina developments of interest in a unified Edina thread. There's a lot going on by Southdale, but not much going on inside Southdale. Anyone know if Dave and Busters has increased traffic flow at all? True. It's why it has its own thread. I'm never there in the evening or weekends when it would be likely to have its crowds. There doesn't seem to be a lunch rush going there. Re: the Opus Redevelopment article...the old United HQ also finally has new tenants (Children's Hospital with 700 employees being added) after being empty for several years. Surveyors stakes are already going in for the regional trail although construction in this area won't be done for a couple years yet...lots of good bike and ped development! Side Note: With all the condos, apartments and workers nearby it amazes me that there is still no restaurant in the immediate area other than a D. Brians that is only open for limited hours. Whoever first opens an upscale casual joint over here is going to rake in the dough. 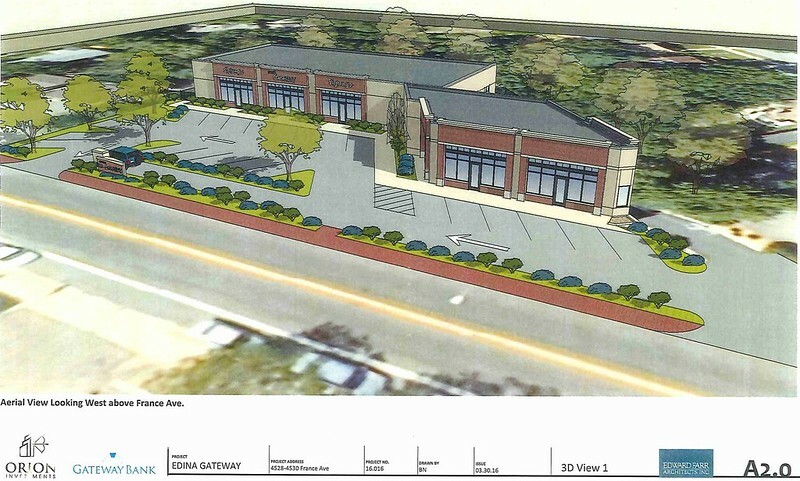 A proposal to build a new retail building using two properties next to Edina Cleaners on France Ave S. Across the street from the Lake Harriet Lodge. Practically the edge of the 44th and France commercial area. Rapid Oil will be demolished. Gateway Bank main tenant. 3 additional retail spaces. Small lot in front, no on street parking. Correction: The additional spaces are not for retail, but for offices. 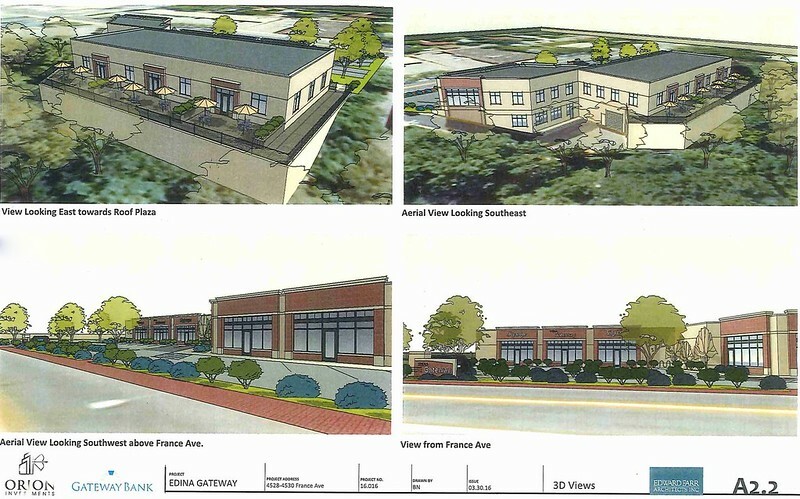 Here are some submitted drawings in the next Edina council agenda packet. Notes: Curb cuts dropped from four to two. Something similar was filed in 2011, but other projects by the developer put this on hold, which is why it has been vacant for a few years. This version has patios for each office out the west (rear) side that the previous proposal didn't have. Here is a Flyover view of the state it is today. Wow that's heinous -- especially nestled between the traditional walk-up areas of 50th/France and 44th/Sunnyside. 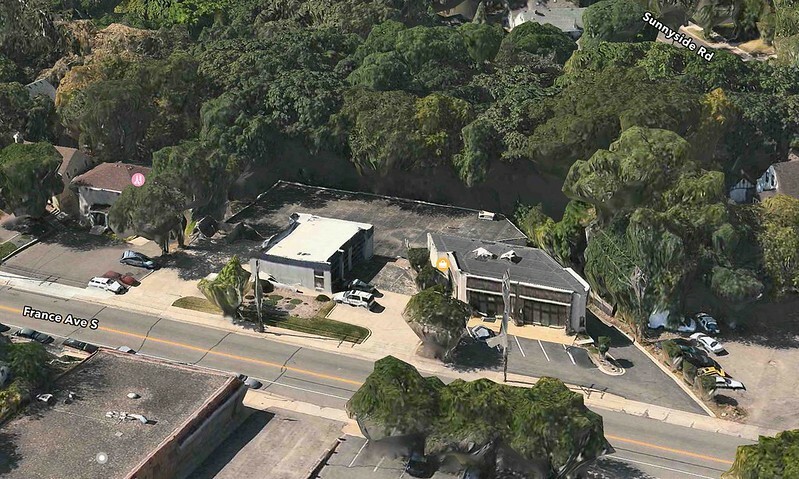 This is tricky, though -- I can definitely see why they want to nestle the building into the woods like that. But surely they can come up with something better than this. So wait, the lower-level 24-space parking garage is already there and they want 23 additional surface spots? The two buildings (existing + new) together are less than 10k ft^2. What business(es) could possibly require that much parking? Maybe for a stealth conversion to a restaurant later? I've never had trouble parking in this neighborhood, west down Sunnyside or 44th. I spent an hour one day months ago about an issue of making Sunnyside carry less traffic than 44th (the state aid street). Many comments in the record from residents on Sunnyside objecting to non residents parking on "their" street (among other typical anger about traffic on a commercial district street with homes on it). I've never had issues either, but that Edina street has a few angry homeowners who don't want interlopers and seem to wish 44th/France was smaller and less successful. mattaudio wrote: I've never had trouble parking in this neighborhood, west down Sunnyside or 44th. I think that's exactly the "problem" for some. Edina is booming like no other suburb right now. More units underway since farmland was turned to homes in 1972. Edina added the Wooddale bridge over the Minnehaha Creek, built in 1937 by the WPA, to its heritage landmark list. In 2014 the state put the bridge on its list to be considered for the National Register of Historic Places, this past February it officially was added. Where's the waterfall that used to fall underneath the bridge? I used to hang out there when I was a kid. It's just upstream a bit, around the bend, under the Browndale bridge. The abandoned gas station at Wooddale and Valley View is now proposed to be a Town Hall Brewery.